Roast Turkey, what could be easier? We all have eaten many a overdone, dried out, and reheated bird. This recipe is extremely simple and it leads to moist flavorful results. To start with, I buy a kosher, no hormone and no antibiotic, free range bird. 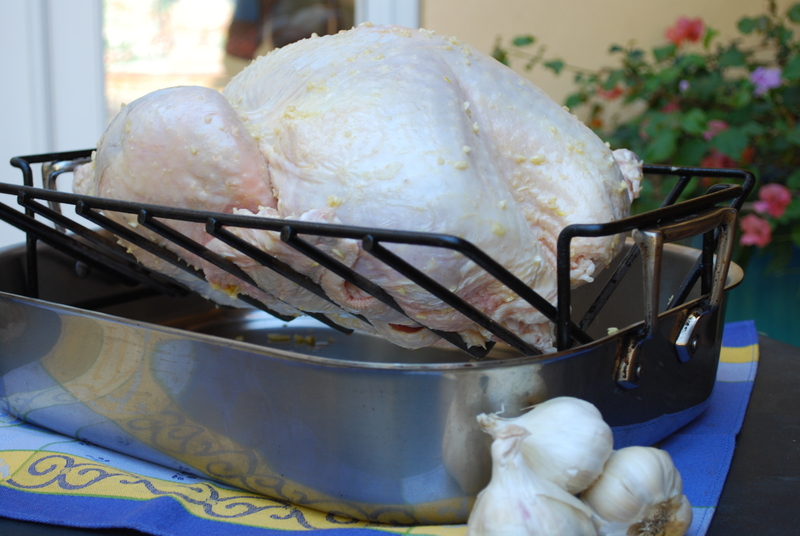 Kosher turkeys have the advantage of being salted (kind of brined) as part of the koshering process. A fresh turkey is great if you can find one, but a frozen bird is very tasty if you defrost it correctly in the refrigerator. Don’t rush the defrosting. I take my turkey out of the freezer two days before I need it. If I am roasting it on Thursday, then I take it out of the freezer and place it in the refrigerator Tuesday morning. Before removing the turkey from the oven, check the temperature of the turkey for doneness. An instant read meat thermometer is a good tool to check the temperature. Insert the thermometer in the thickest part of the thigh. 165º indicates it is ready. After roasting, the turkey will continue to cook while it is resting in the roasting pan on the counter. Garlic and olive oil do a magical thing to the turkey flavor. They infuse and compliment that slightly gamey bird taste with richness more like beef. The most important thing is to let the turkey rest for at least 60 minutes before carving and never reheat turkey. Wash the turkey inside and out and pat it dry with paper towel. Set the giblets and neck aside for stock for gravy. 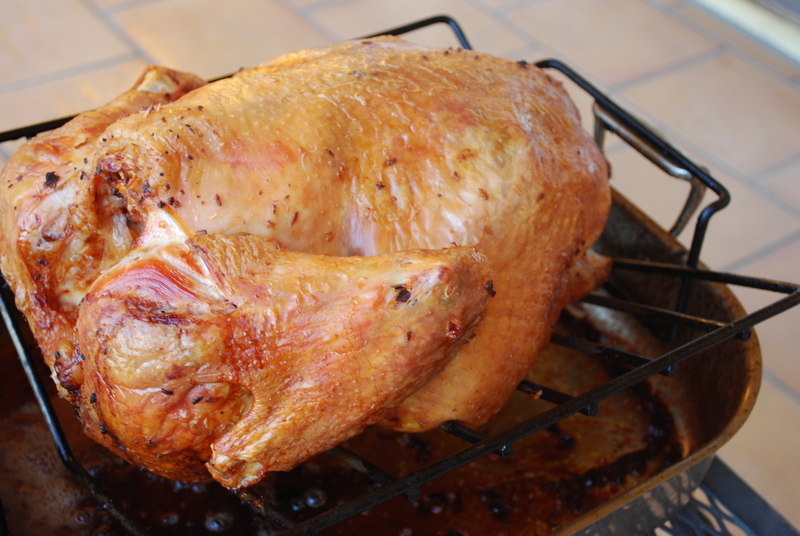 Leave the turkey out of the refrigerator for about an hour so it is room temperature. Place the garlic cloves in a mini food processor. Add the oil to the garlic and puree. Rub the garlic paste all over the turkey, inside and out. Tie the drum sticks together with twine. If the skin is torn, sew it up with a turkey kit or toothpicks and some kitchen twine. Place the turkey on a rack in the roasting pan breast side down. Make a tent with heavy duty aluminum foil. Set the ten loosely on top of the bird. You can attach the tent to the long sides of the roasting pan but the ends should be open. Place the turkey in a preheated 325º oven. Roast, tented for approximately 3 hours. Uncover turkey and roast for 1 additional hour until well browned. Check the temperature once or twice, a turkey this size could take up to 4 or 4.5 hours depending on how large the bird is and how cold it was when it went in the oven. Over-roasting, the turkey will cause it to be dry. Check the temperature with an instant-read thermometer in the thickest part of the thigh. It should register around 165º. The turkey needs to sit uncovered for about an hour before carving. Do not carve straight from the oven. To carve remove the whole legs by slicing through the groin joint and then remove the breasts individually in whole pieces. Slice the breast crosswise and fan out. Slice the dark meat off the thigh. I make a turkey platter in 3 sections. White meat fanned, dark thigh meat sliced and the bones pieces i.e. wings and drumsticks. Place the pan juices in a glass measure and allow the fat to rise to the top for easy removal. The pure gelatin with the intense flavor will stay at the bottom. You can just use this gelatin for au jus or use it to flavor the gravy or stuffing. Love your recipes, Linda….any ideas for butternut squash????? Your turkey looks beautiful. This year I tried the 2 hour roasting method from Safeway. I was able to buy a fresh Glatt kosher turkey from Trader Joes and I seasoned it with olive oil, garlic and Hungarian paprika. 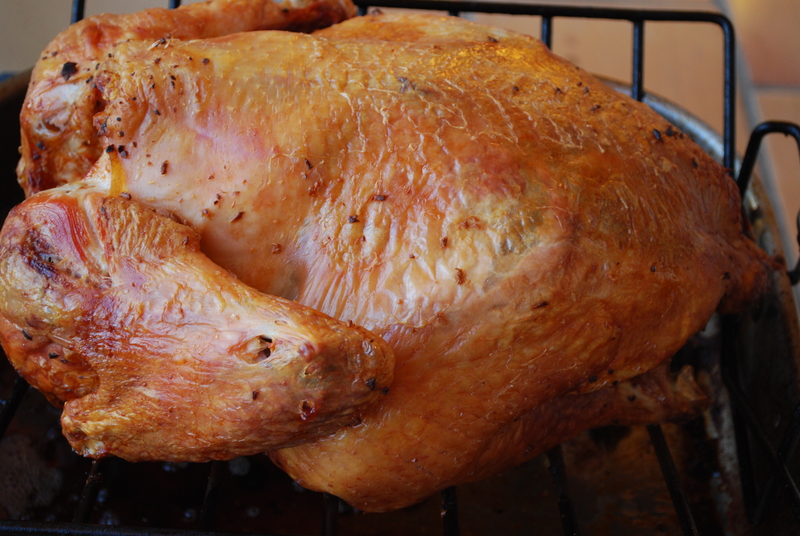 I roasted my 13.3lb bird in a 475 degree oven and it was finished in 1.25 hours. It was moist and yummy. I would recommend this method to all.